Before we leave for Frankfurt, I’ve got another review for you. As you all know, Clarkson Potter provided me with an ARC of Provence, 1970 by Luke Barr a while ago. The book will be out on October 22 in the US, Austria, Germany,… and obviously on November 20 in the UK. 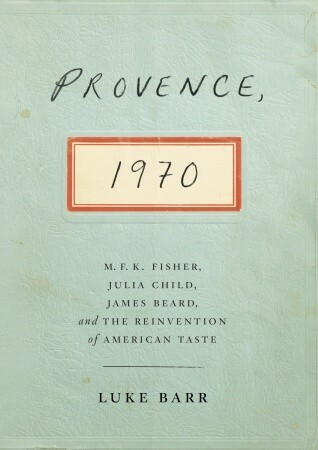 Provence, 1970 is a historical non-fiction book that mainly deals with M.F.K. Fisher’s 1970 trip to Provence. The author Luke Barr was able to make me feel Provence in some parts of the book, which is more than I would expect of a work of non-fiction. Provence, 1970 even offers dialogues which sometimes made me wonder if I wasn’t reading a novel after all. The explanation for this comes at the end of the book (at least in the ARC), where Barr lists all his sources. Unfortunately, there weren’t any footnotes in the text (again, in the ARC). I would have liked that, but I do understand that there are people who feel disturbed by them. Provence, 1970 was an informative and entertaining read. As I wasn’t well acquainted with any of the iconic culinary figures besides Julia Child, the book offered new information. I also really liked that Barr went to France to visit the Childs’ Provence home to get his own perspective. Overall, Provence, 1970 is a mouth-watering work of non-fiction for people who like good food, travel writing, the 1970s, France and American cooks. Next > Frankfurt Book Fair – We’re Back!